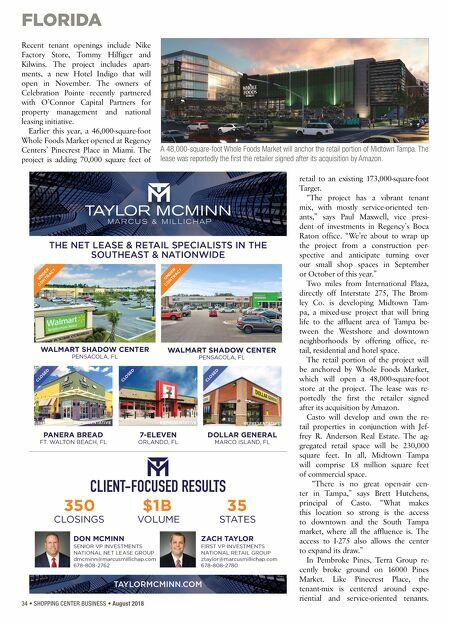 FLORIDA 34 • SHOPPING CENTER BUSINESS • August 2018 Recent tenant openings include Nike Factory Store, Tommy Hilfiger and Kilwins. The project includes apart- ments, a new Hotel Indigo that will open in November. The owners of Celebration Pointe recently partnered with O'Connor Capital Partners for property management and national leasing initiative. Earlier this year, a 46,000-square-foot Whole Foods Market opened at Regency Centers' Pinecrest Place in Miami. The project is adding 70,000 square feet of retail to an existing 173,000-square-foot Target. 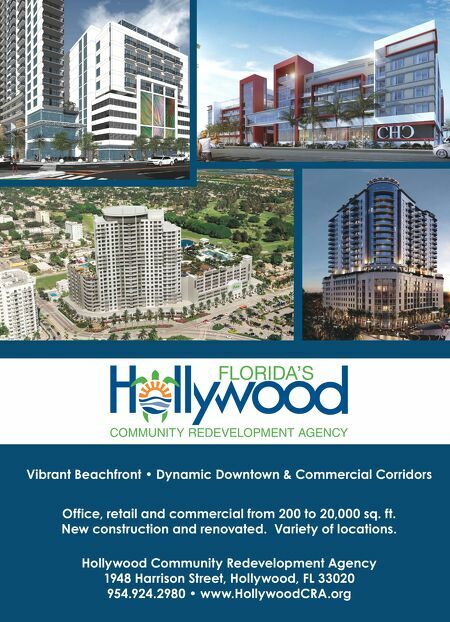 "The project has a vibrant tenant mix, with mostly service-oriented ten- ants," says Paul Maxwell, vice presi- dent of investments in Regency's Boca Raton office. "We're about to wrap up the project from a construction per- spective and anticipate turning over our small shop spaces in September or October of this year." Two miles from International Plaza, directly off Interstate 275, The Brom- ley Co. is developing Midtown Tam- pa, a mixed-use project that will bring life to the affluent area of Tampa be- tween the Westshore and downtown neighborhoods by offering office, re- tail, residential and hotel space. The retail portion of the project will be anchored by Whole Foods Market, which will open a 48,000-square-foot store at the project. The lease was re- portedly the first the retailer signed after its acquisition by Amazon. Casto will develop and own the re- tail properties in conjunction with Jef- frey R. Anderson Real Estate. The ag- gregated retail space will be 230,000 square feet. In all, Midtown Tampa will comprise 1.8 million square feet of commercial space. "There is no great open-air cen- ter in Tampa," says Brett Hutchens, principal of Casto. "What makes this location so strong is the access to downtown and the South Tampa market, where all the affluence is. The access to I-275 also allows the center to expand its draw." In Pembroke Pines, Terra Group re- cently broke ground on 16000 Pines Market. Like Pinecrest Place, the tenant-mix is centered around expe- riential and service-oriented tenants. A 48,000-square-foot Whole Foods Market will anchor the retail portion of Midtown Tampa. The lease was reportedly the first the retailer signed after its acquisition by Amazon.